I have uploaded my latest YouTube video entitled “Digitally Manipulated “Fish in the Margins” Imagery on the so-called “Jonah Ossuary.” The video walks viewers through an illustrated version of an earlier blog post I wrote entitled, “Sins of Commission and Omission: Digitally Generated Marginal ‘Fishes’ and Overlooked Handles on the So-called ‘Jonah Ossuary’“. Digitally inked images were released to the public without acknowledging that the videos had, in fact, been inked (with ink colored to look like a naturally engraved area). (After I wrote my blog post, they later designated the image as “marked” and uploaded the “uninked” image for comparison). The digital ink does not correspond to the engraved areas, giving the illusion of a fish where none is present. Dr. James Tabor has once again doubled down on his theory, shared by his Jesus Discovery co-author, Mr. Simcha Jacobovici, that Ossuary 6 discovered in a tomb in Jerusalem is covered in fish. Having “jumped the tropical fish shark,” Dr. Tabor is once again making a number of rhetorical arguments that attempt to distract from the evidence at hand. They’ve made their analysis and they’ve moved on. They may still stand by their analysis, and they may not. They’ve followed the scientific paradigm of presenting their own theory, and then allowing other scholars present other theories, and they are now allowing those theories that appear to be gaining more scholarly consensus to stand. Because they’ve not said anything, we can’t be sure they based their initial analyses upon Photoshopped imagery (as I conceded I had done). But this is an example of a rhetorical logical fallacy. Just because the initial critics have fallen silent does not mean that the more recent, more populous criticisms are not valid. Likewise, attempting to argue, “Well, because different scholars have proposed different theories, then some scholars who opposed us must be wrong,” doesn’t make the “fish theory” any more correct. This is a logical fallacy. The logical fallacy employed here is the errant assumption that because it is ‘unique,’ his ‘unique’ interpretation is correct. Dr. Tabor gets bonus points for an “appeal to dissenters,” arguing that because those who disagree with his interpretation also agree that it is ‘unique‘, that they must also support the remainder of his interpretation. They do not. This is another example of a logical fallacy. Just because it is unique does not make it a fish, as it could be another unique object. The third and perhaps most egregious fallacious argument is Dr. Tabor’s argument concerning the handles on his fish. I (and others, namely Mark Goodacre, Tom Verenna, Michael Heiser, ) have demonstrated in earlier posts that Dr. Tabor’s multiple ‘fish’ appear to have handles. Nothing to see here. Please disperse. There is no handle here. You are "imagining" things. It is a "random scratch." It is "unattached." It is only a "couple of stray lines." What is highlighted in red above is "simply not there." They were "made by mistake." It's only a flesh wound. Nothing to see here. No handles here either. Again, you are "imagining" things. They are completely "random scratches." They are just "stray lines" "made by mistake." They are "simply not there." Of course, what Dr. Tabor fails to mention is that the ‘fish’ appears to have the same “imagined” “mistaken” “unconnected” “randomly scratched” “stray lines” in the same random size, in the same random shape, and in the same random place on the opposite corresponding side of the vessel! (Coincidentally, these are clearly seen in an image that Dr. Tabor did not show in his blog post, and that for some reason conveniently does not appear among the thejesusdiscovery.org website photos). You are "imagining" things. That thing on the top right of the vessel is simply some stray lines that just so happen to be in the same random size, and in the same random shape, and in the same random position on the corresponding side of the vessel er, fish. It's "simply not there." Can't you *not* see? You are "imagining" things. That thing on the top right of the vessel is simply some stray lines that just so happen to be in the same random size, and in the same random shape, and in the same random position on the corresponding side of the vessel, er, fish. It's "simply not there." Can't you *not* see? P.S. For those reading who do not know me, Dr. Tabor, or the other scholars involved in this debate, please know that everyone involved has a very good sense of humor, which allows us to remain in professional conversation about the “Jonah Ossuary.” Several of us (including me here and here and Dr. Tabor here) have made use of humor, parody, and satire at times in our arguments. In keeping with this tradition, please allow me to conclude with perhaps Monty Python’s best known sketch (and a true comedic masterpiece), which I believe best illustrates Mr. Jacobovici and Dr. Tabor’s continued insistence that the imagery on Ossuary 6 is a healthy, beautiful, easy-to-see parrot fish. Mr. Jacobovici and Dr. Tabor are the shopkeeper behind the counter, and the rest of the academy (not somehow affiliated with Simcha or this project) is the customer. Enjoy. I have created a new video on my YouTube account, which is a tutorial explaining how to correct for perspective in Photoshop. 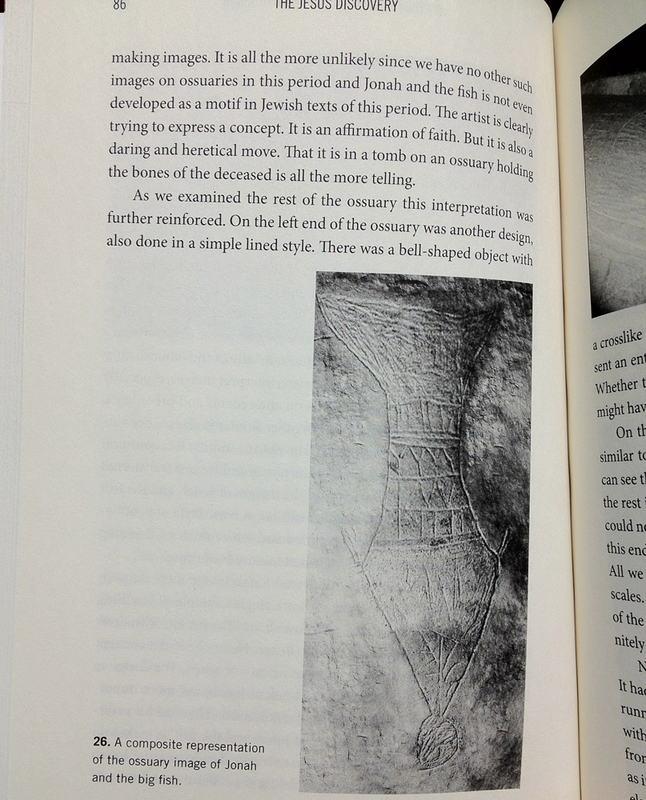 The tutorial was prompted by the release of a CGI image of the so-called “Jonah Great Fish” image inscribed on Ossuary 6 discovered in a tomb in Jerusalem, as well as other images released by Dr. James Tabor and Mr. Simcha Jacobovici in their book, The Jesus Discovery. Give it a watch (and apologies in advance for the 26 minute length). I recently read the latest post by Dr. James Tabor on his jamestabor.com blog. I circulated the “fish” image to three fish experts, two staff members of a large marine biology center in the US and one a renowned ichthyologist from Israel. What Dr. Tabor didn’t mention in his blog is that Mr. Lutgen’s ichthyologist friend identified the Ossuary 6 image specifically as a triggerfish of the family Balistidae. 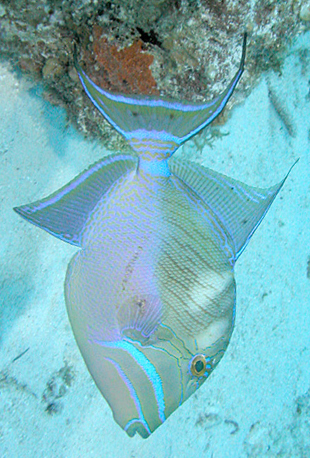 I have included a picture of a triggerfish below. The largest member of the family, the stone triggerfish (Pseudobalistes naufragium) reaches 1 metre (3.3 ft), but most species have a maximum length between 20 and 50 centimetres (7.9 and 20 in). You read that correctly: the “Jonah’s Great Fish” tale has become so precarious, that the theory of a “fish” depicted on Ossuary 6 has come to rely on its similarity to a 50 cm tropical fish. A triggerfish bite. No wonder the artist of the "Jonah Ossuary" drew a stick figure: they are easier for tropical fish to swallow. 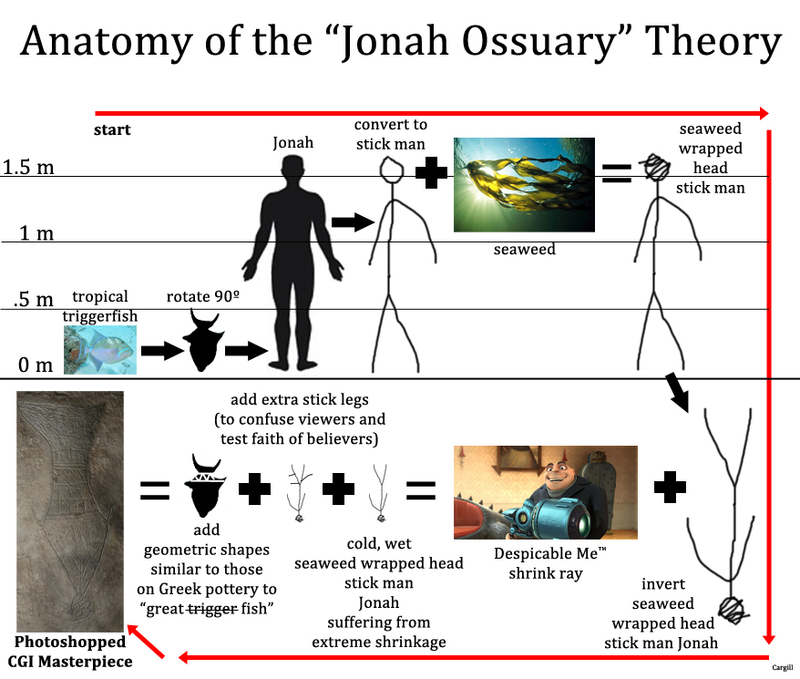 The Anatomy of the "Jonah Ossuary" Theory. These are the steps one must accept in order to conclude that a 50 cm tropical fish is the inspiration behind the image of a supposed "great fish" inscribed on Ossuary 6. I’m just not certain that this is the דג גדול (“great fish”) that Jonah 1:17 (2:1) was talking about. Why would an artist choose a 50 cm tropical fish, more likely to be found in the tropical and subtropical reefs in the Gulf of Aqaba than in the Mediterranean (Joppa to Tarshish), to represent a “great fish” capable of swallowing a man? And why would said artist spend so much time illustrating the relatively intricate geometric designs on the “body” of the vessel “fish” and then make a stick figure human? Jumping the shark is an idiom created by Jon Hein that is used to describe the moment in the evolution of a television show sensational archaeological theory when it begins a decline in quality that is beyond recovery. The phrase is also used to refer to a particular scene, episode or aspect of a show the supposed “evidence” in which the writers use some type of “gimmick” in a desperate attempt to keep viewers’ interest. I’m sorry, but I don’t know how else to say it. There are no fishes on the ossuary. The “fish in the margins” are not fish. (They are oval decorations.) The “half fish” is not a fish (It is a vessel with visible handles on each side). And the “Jonah fish” is not a fish. (It, too, is a vessel with handles on each side.) The “seaweed wrapped head” is not a seaweed wrapped head. (It is the base of the vessel). And the inscription does not say what Mr. Jacobovici and Dr. Tabor say it says (see also here). I have no problem with Dr. Tabor’s argument that the “sign of Jonah” and the iconography of a “great fish” are symbolic of resurrection. None whatsoever. It has much merit. The problem is, we simply don’t have fish or the “sign of Jonah” in the “Patio Tomb,” not with the iconography, not with the inscription. And with the recent appeals to parallels with tropical fish, I’m afraid all we’re now at the moment where Fonzie “jumps the shark,” only in this case, it’s a tropical fish, thereby signalling the beginning of the end of this entire ordeal. As I continue to examine the new, hi-resolution images that my colleague, Dr. James Tabor, has released on the thejesusdiscovery.org website’s “Press Kit Photos and Graphics” page (and many thanks to Dr. Tabor and his team for doing so! ), I came across a beautiful, hi-res photo of the base of the inscribed image. Image 15 from the thejesusdiscovery.org website, captioned "Detailed Jonah Image - no cgi" (Available at: http://thejesusdiscovery.org/press-kit-photos/?wppa-album=3&wppa-photo=15&wppa-occur=1). 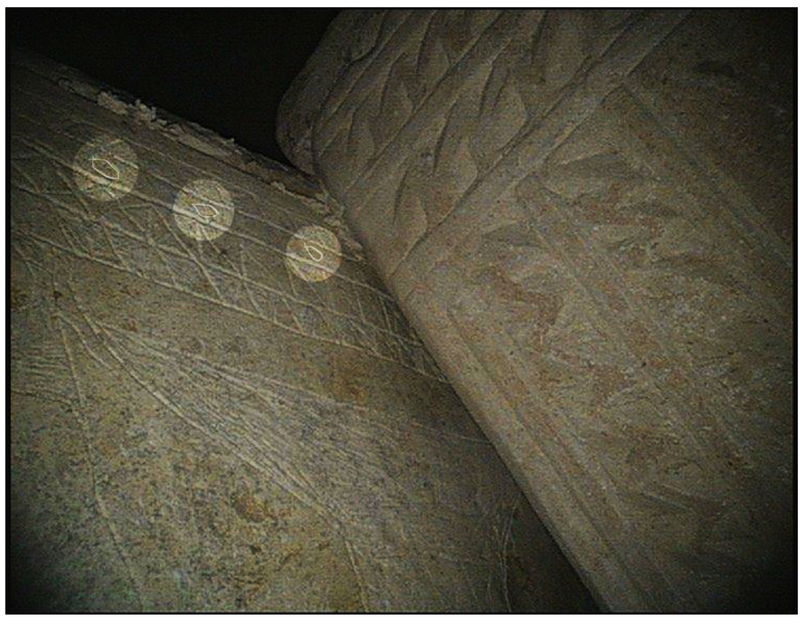 The image shows a close-up of the bottom of the image inscribed on the front left panel of Ossuary 6 (the proposed "Jonah Ossuary"), rotated 90-degrees clockwise from its in situ orientation. Many scholars, however, are now convinced that the image that Dr. Tabor and Mr. Jacobovici are interpreting as a “Great Fish” spitting out the seaweed-wrapped head of Jonah (and thus a reference to the resurrection of Jesus, as both were said to have spent three days in their respective places), is actually an attempt by an ancient artist at a representation of a vessel of some sort, which are commonly found on ossuaries from Jerusalem. One problem I have had with an interpretation as a vessel, however, has been how to reconcile the roundish engraved area at the base of the image (the stick figure’s “seaweed-wrapped head”). However, based upon the new photos released by the thejesusdiscovery.org website, I’d like to suggest a possible – and I stress possible – solution. It is fair to say that the skill of the artist who engraved the image on the front of Ossuary 6 lies somewhere between the professionally made, inscribed ossuaries we find in Jerusalem, like the well-known “Joseph, son of Caiaphas” Ossuary (see front panel below) and graffiti (see side panel inscription of name below, which is more like the image inscribed on Ossuary 6). Thus, while the “Patio Tomb” Ossuary 6 artist may not be a seasoned professional artisan, he still may have attempted some advanced techniques. This may be the case with the base of what I propose is an inscribed representation of a vessel on the front of Ossuary 6. Image 15 from the thejesusdiscovery.org website, showing the bottom of an inscribed image (Available at: http://thejesusdiscovery.org/press-kit-photos/?wppa-album=3&wppa-photo=15&wppa-occur=1). The roundish image at the bottom may be an attempt to represent the half-spherical base of a vessel by the artist. 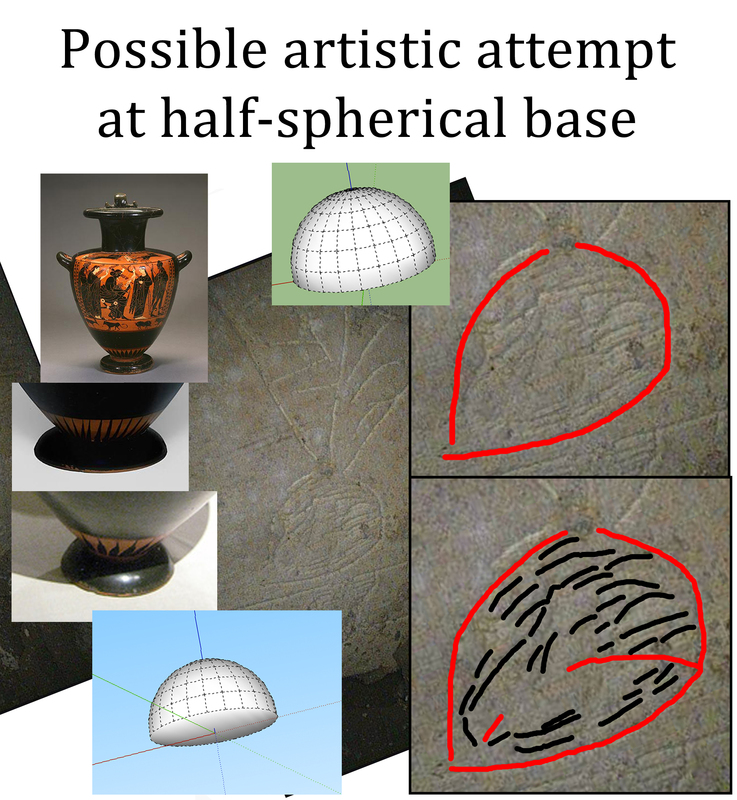 Surrounding the untouched photo (which has been rotated back to its in situ orientation) are (clockwise from top right): a blowup of the area under examination; an artificially inked outline of the engraved area depicting the edges of the object in red and the engraved marks representing the curved and flat surfaces of the base in black); a Google Sketch-up digital model of the base of the vessel in approximate orientation; the bases of various vessels representing half-spherical bases. Note that the roundish area at the base of the image under examination above is not actually round, but more of a sphere with a flattened bottom. Note also that the engraved lines used to fill in the area also appear to have a consistent pattern to them: those engraved lines toward the top of the sphere (above the artificially inked red outline of the inscribed image above) appear to all be curved down at their ends perhaps representing the curved surface of the top of a spherical base, while the engraved lines at the bottom of the image (the flattened part of the sphere below the red line in the image above) all appear to be straight or curve up at their ends, perhaps representing the flat, circular bottom of the base. 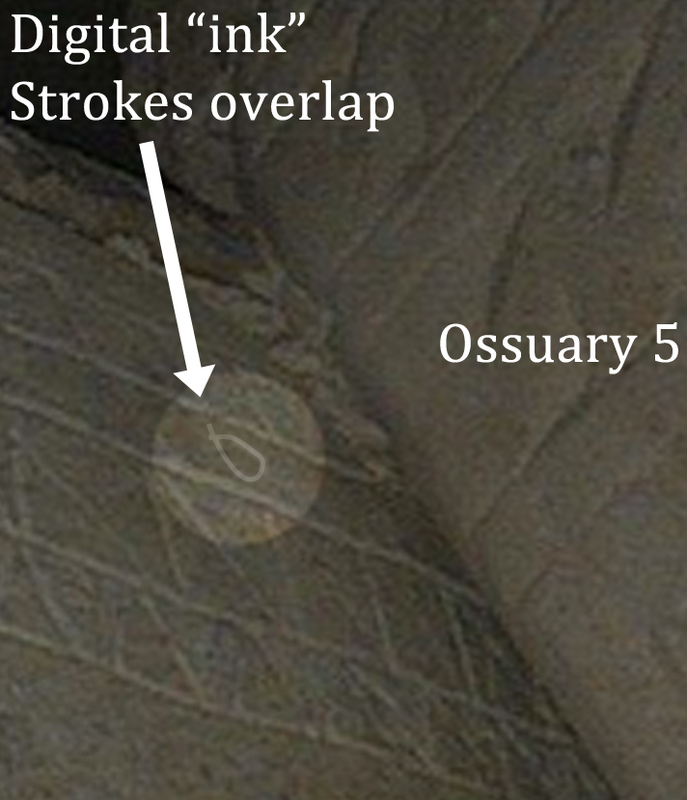 Thus, the roundish object at the bottom of the inscribed image on Ossuary 6 may be an early attempt to represent the half-spherical base of a vessel by the artist in perspective. This would be quite a fascinating discovery in its own right! The level of execution on the attempted representation of the base is consistent with level of artistic ability exhibited throughout the rest of the inscribed image. I created a very quick Google Sketch-up digital model (blue background) of my proposed base of the vessel and placed it in its approximate orientation next to the image. I’ve also added representative images of bases similar to what I’m arguing the ossuary artist is attempting to represent. Image 15 from the thejesusdiscovery.org website, showing the bottom of an inscribed image (Available at: http://thejesusdiscovery.org/press-kit-photos/?wppa-album=3&wppa-photo=15&wppa-occur=1). 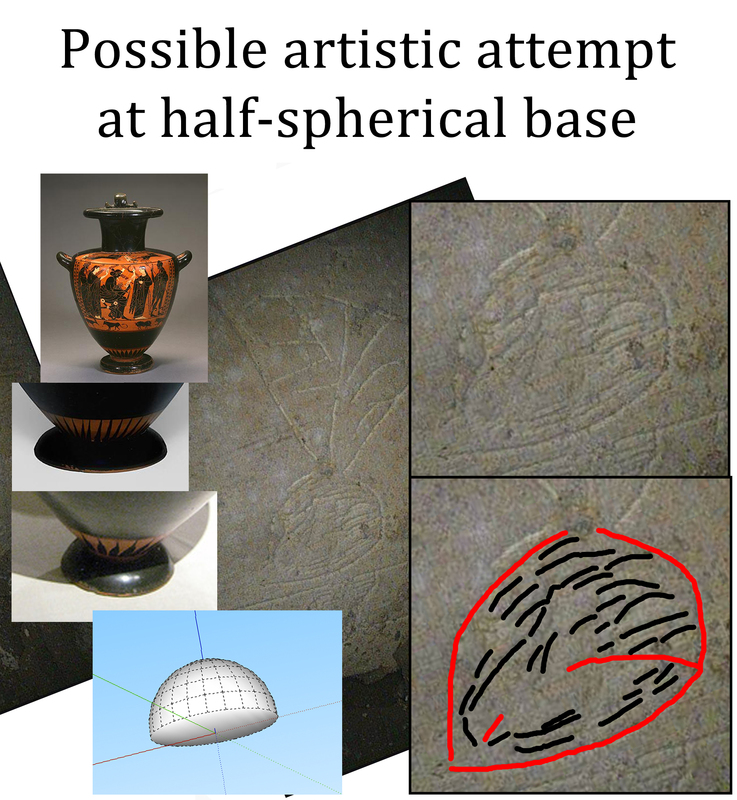 The roundish image at the bottom may be an attempt to represent the half-spherical base of a vessel by the artist, perhaps in perspective. Surrounding the untouched photo (which has been rotated back to its in situ orientation) are (clockwise from top right): a Google Sketch-up digital model (green background) showing the possible base not in perspective in approximate orientation; a blowup of the area under examination with artificially added red ink outlining the border not in perspective; an artificially inked outline of the engraved area depicting the edges of the object in red and the engraved marks representing the curved and flat surfaces of the base in black) in perspective; a Google Sketch-up digital model (blue background) of the base of the vessel in perspective in approximate orientation; the bases of various vessels representing half-spherical bases. UPDATE: I’ve also added a Google Sketch-up digital model (green background) of my proposed base of the vessel, which would show the base not in perspective, but rather simply as a flattened half-sphere. Again, I stress that it is a possible alternative to the stick figure’s “seaweed-wrapped head” proposed by Dr. Tabor and Mr. Jacobovici, but I welcome feedback from my colleagues. I’d also welcome feedback from anyone who may know at other early attempts to represent perspective in art, especially on ossuaries from Jerusalem, as Ossuary 6 might be quite unique in this regard. And thank you again to my colleague Dr. Tabor for making the new images available to me and to the public. 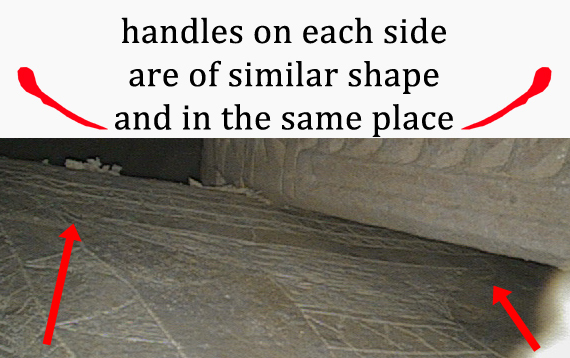 UPDATE: See Steve Caruso’s article on how correcting the base of the Ossuary 6 inscribed vessel for rotation and perspective causes the base to look even more like the half-spherical base a vessel. Criticisms of the Film,” jamestabor.com, June 22, 2011, p. 45. Marcus Aurelius suggested that there are two kinds of sins: those committed by commission, and those committed by omission. And while the word “sin” connotes a religious wrongdoing and would therefore be inappropriate for an academic discussion of archaeology and the Digital Humanities, the underlying paradigm is unfortunately still quite apropos. 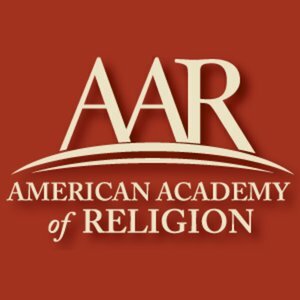 Put simply: there are alterations that can be committed to evidence to enhance and promote certain otherwise unlikely interpretations of the data, and there are other instances where pieces of evidence are conveniently omitted when they detract from the interpretation being promoted by a particular scholar. Unfortunately, recent examination of additional photos released to the public in support of Simcha Jacobovici and Dr. James Tabor’s alleged recent discovery of a “Jonah” ossuary suggests that the pair (and/or their artists) may be responsible for both additional manipulations of the evidence, and the omission of obvious evidence that does not support their claims. I and others have detailed the various problems with the imagery released to the public by Mr. Jacobovici and Dr. Tabor in support of their recently released book, The Jesus Discovery. Specifically, I have documented evidence of digital image manipulation on the primary image fed to the public (that also happens to serve as the pair’s website header logo) that has been variously described as a simple “blow up,” (Fig. 21, pg. 42 of Dr. Tabor’s original Bible and Interpretation article) then a “composite representation” (Fig. 26, pg. 86 of The Jesus Discovery), and then a “CGI enhanced” image, and finally acknowledged as a “computer enhanced” image on the pair’s website. I suggest a more appropriate way to refer to this particular image is as a heavily Photoshopped, out of context, borderless, “computer enhanced”, resized, reshaped, color corrected, “CGI” digital artist’s rendering of the image, rotated out of its in situ orientation, complete with fake, limestone-colored “engraver’s marks” added to the area surrounding the image to give the illusion that the image is real, and with a completely reshaped, digitally generated tail designed to encourage its interpretation as a fish. We can let the readers decide if that image is simply “computer enhanced” or, as I suggest, wholly reconstructed. I thought it ended there. Unfortunately, my colleague Thomas Verenna recently drew my attention to yet another problem with yet another one of the images that Mr. Jacobovici and Dr. Tabor have offered to the public in support of their claim. This time, in addition to using Photoshop to “digitally enhance” an image to make it better support their claim, there is also reason to believe that the pair has omitted evidence that demonstrates that their proposed “Jonah fish” is nothing more than a poorly inscribed attempt by an ancient artist at an ornate vessel – complete with handles – that are otherwise common to ossuaries of that period. Let us begin with problems arising with the commission of digital manipulation. There are two major problems with the image below (from thejesusdiscovery.org, Image 16, captioned “Fish in the margins”): one of omission and one of commission. Let us first address the evidence of commission, specifically, evidence of digital manipulation to the above image to encourage an interpretation of images as fish. The photo below is the “Fish in the margins” image, which has been cropped to remove the heading, and which has had the “brightness” increased a level of 52 and the “contrast” increased a level of 92. Increasing the brightness and contrast makes dark images easier to see, and increasing the contrast makes different elements on the image stand out against one another. "Fish in the margins" photo with brightness and contrast raised. (Available at: http://thejesusdiscovery.org/press-kit-photos/?wppa-album=3&wppa-occur=1&wppa-photo=16) Note Ossuary 5 on the right is pressed up against the so-called "Jonah Ossuary" (Ossuary 6). The first thing one notices in the above image put forth by Mr. Jacobovici and Dr. Tabor is that the image has obviously been digitally “spotlighted,” or enhanced in such a way so as to brighten and draw attention to certain objects in the image. Unfortunately, this simple “spotlighting” is not the only manipulation made to the image, and the additional alterations that have been made to the photograph appear designed to create the illusion that there are “fish swimming” in the margins of the photo (hence the image’s title, “Fish in the margins”), with the hopes of thereby enhancing the authors’ claim that the image just beneath the “spotlighted” border is a fish and not a vessel of some sort. The causal observer may miss the more cleverly disguised alterations to this image. However, a closer examination of the above image reveals that the “Fish in the margins” image has been digitally “inked” using a Photoshop “pencil” or “brush” tool. That is, a careful look at the three proposed “fishes” betrays the fact that each of the engraved circles spotlighted above has had small digital pixels of color added to the grooves of the image to “enhance” the natural lines apparent in the photograph. This digital “ink” is not easily noticed because the color of the line has been carefully chosen to resemble closely the color of the surrounding engraved lines, perhaps in an effort to make the artificial “ink” added to the engraved lines look more natural. This digital “ink” was applied rather well in my opinion by the digital artist altering the image, as I did not notice it at first glance. Then again, there was no reason to suspect that the image had been doctored, as there is no indication whatsoever on the image or in its caption stating that the image has been digitally “enhanced,” “altered,” “inked,” or manipulated in any way other than the obvious spotlighting. Rather, it was only after a close-up examination of the high-resolution image that I noticed the naturally colored, but quite artificial digital “ink” in the engraved area. Had that been the extent of the image manipulation, one might be able to dismiss it as simple “enhancement” for highlighting purposes. Unfortunately, there is a still greater problem with the digital “inking” alteration: the digital ink does not align with the engraved lines. That is, the artificial digital “ink” added to the photograph extends well beyond the engraved lines. This may have been done to foster the illusion of the presence of fishes (akin to the so-called “Jesus fish” one finds on the back of a vehicle) in the border, thereby encouraging, by similarity and multiplicity of the images, the interpretation of the larger image just below as also a fish. 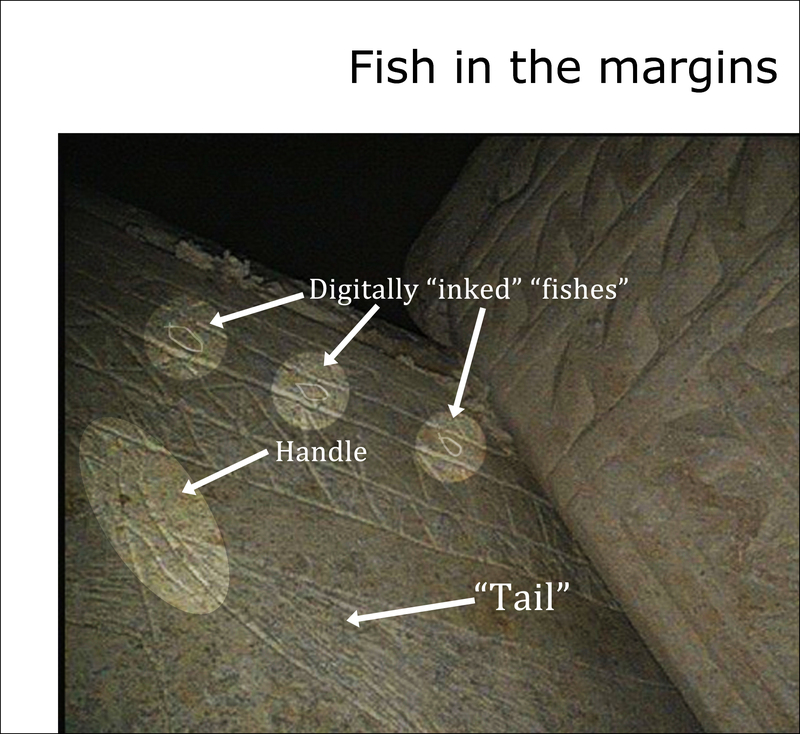 Unfortunately, one quickly notices from a different photo, entitled “Fish in the margins detail,” offered to the public by Mr. Jacobovici and Dr. Tabor that the actual engraved lines comprising this so-called “fish” in fact do not overlap. The image above (which has also experienced an artificial Photoshop “spotlight” filter) does not possess the digital “ink” present in the “Fish in the margins” image. 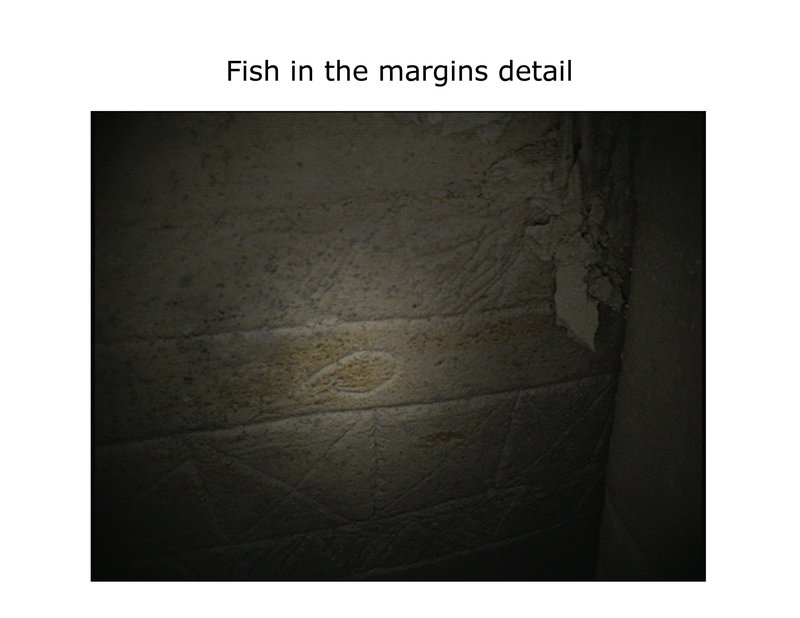 A closer examination of this “Fish in the margins detail” image (above) reveals that the engraved lines of the supposed “fish” closest to Ossuary 5, in fact, do not overlap, and therefore do not form a little “Jesus fish” shape. If we place these two images side-by-side, we can see the alterations that have been made to the “Fish in the margins” image. 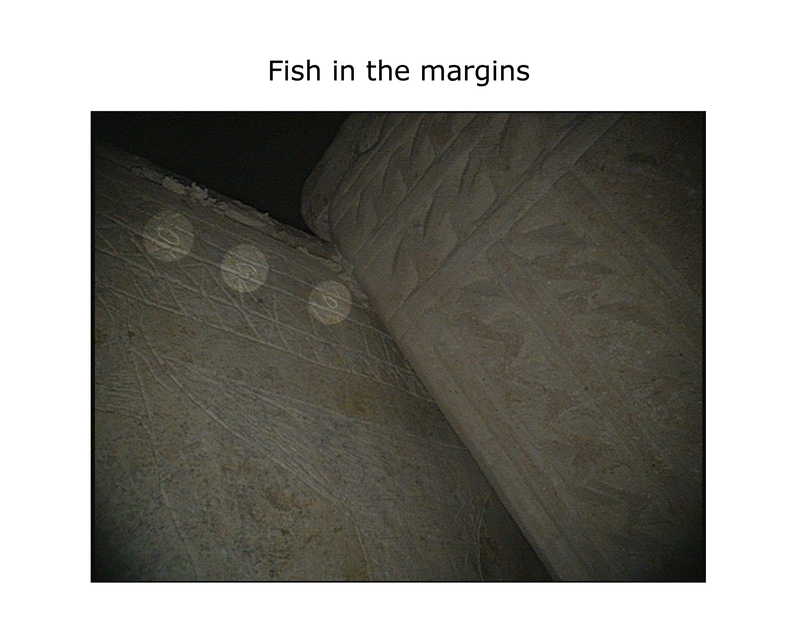 The "Fish in the margins detail" image (left) and the "Fish in the margins" photo from thejesusdiscovery.org website demonstrate that the digital enhancements to the "Fish in the margins" image include artificial digitally "inked" lines colored to look like naturally engraved limestone lines that do not correspond to the engraved lines on the ossuary. The digital "ink" extends well beyond the engraved lines of the actual image, which do NOT overlap. This means that the image was digitally altered to generate the illusion of small "fishes swimming" around the edges of the ossuary, perhaps to support the illusion that the image just beneath them is a "fish" and not some sort of vessel. One can clearly see that the image has been drawn to suggest a “Jesus fish” image where there clearly is none. 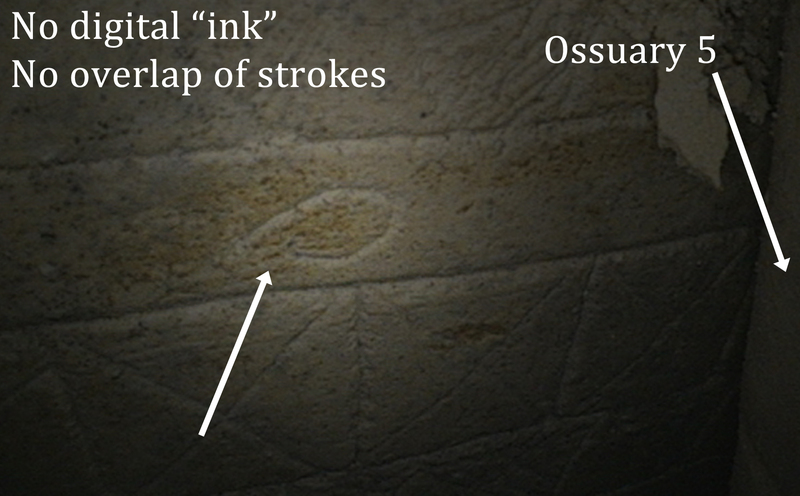 The “Fish in the margins” image contains artificially added, digitally “inked” lines colored to resemble naturally engraved limestone lines, which do not correspond to the engraved lines on the ossuary. The digital “ink” extends well beyond the engraved lines of the actual image, which do NOT overlap. This means that the image was digitally altered to generate the illusion of small “fishes swimming” around the edges of the ossuary, perhaps to support the illusion that the image just beneath them is a “fish” and not some sort of vessel. The evidence of commission presented above is indisputable. An unacknowledged digital alteration was clearly made to the “Fish in the margins” image to create the illusion that there are fishes swimming around the edges of the ossuary. And again, this digital manipulation is nowhere acknowledged in the image or its caption. This is textbook digital manipulation of a image for the purposes of supporting a particular claim. Let us now examine possible evidence of omission of data. Furthermore my colleague Dr. Mark Goodacre, along with comments by Don Griffith on the ASOR blog, have also noted that another image on the same ossuary, which I call a “half fish,” and which Mr. Jacobovici and Dr. Tabor interpret as a “Big Fish tail,” may also have handles and may also be an attempt at an inscribed vessel of some sort. The "half fish" image, captioned as "Big Fish tail, back of "Jonah" Ossuary, 1981" (available at: http://thejesusdiscovery.org/press-kit-photos/?wppa-album=3&wppa-photo=46&wppa-occur=1). The image shows what appears to be the top of some sort of vase or other vessel photographed during Kloner's investigation in 1981, but Jacobovici and Tabor interpret it as the tail end of a "Big Fish." One will note a loop (possibly a handle) on the upper left corner of the image, and also note curved handles stretching down from the top to the body of the vase on each side. Image 47, captioned "Jonah Ossuary, 1981", photographed during Kloner's investigation in 1981 (Available at: http://thejesusdiscovery.org/press-kit-photos/?wppa-album=3&wppa-photo=47&wppa-occur=1) shows the end of the so-called "Jonah Ossuary" and what Jacobovici and Tabor interpret as a "Big Fish" diving downward. However, the image appears to reveal faint handles on both sides. The 'half fish" image (Image 46) from the thejesusdiscovery.org website (Available at: http://thejesusdiscovery.org/press-kit-photos/?wppa-album=3&wppa-occur=1&wppa-photo=46). Note the clear presence of curved handles on both sides of the engraving, connecting the top of the image to the body. There is an engraved line in the shape of an oval loop on the upper-left and perhaps the upper-right corner of the engraved image. The handle on the right is fairly obvious, there appear to be two possibilities for lines comprising the handle on the left side: one closer to the body (congruent with the handle on the right) and one farther from the body, which appears to connect with the looped engraving on the upper-left corner of the image. The “half fish” image (Image 46) from the thejesusdiscovery.org website reveals the clear presence of curved handles on both sides of the engraving connecting the top of the image to the body. Note the engraved line in the shape of an oval loop (spotlighted above) in the upper-left corner and the upper-right corner of the engraved vessel. And while the handle on the right is fairly obvious, there appear to be two possibilities for lines comprising the faint handle on the left side. One is closer to the body and would be congruent with the handle on the opposite side. The other possibility is a handle that arches farther from the body and appears to connect with the looped engraving on the upper-left corner of the image. Image 47, captioned: "Jonah Ossuary, 1981" (Available at: http://thejesusdiscovery.org/press-kit-photos/?wppa-album=3&wppa-occur=1&wppa-photo=47). Image 47 clearly shows a handle on each side of the vessel, along with an oval loop on the upper-left corner of the image. There is a question whether the left handle makes an angle (black arrows) and arches back to the top of the vessel, or takes a wider curve back to the top. Note in the above Image 47 taken in 1981, the image clearly shows handles on each side of the vessel. The oval loop (spotlighted above) on the upper-left corner of the image is also clearly visible. There is a question whether the left handle makes a right angle (black arrows) and returns back to the top of the vessel, or makes a wider curve back to the top. However one interprets the above images, it is quite clear from these untouched, original photographs that this image is not a fish, but an attempt to represent a vessel of some sort, complete with handles, attaching at oval loops in the the upper-left and upper-right corners of the vessel. Or, to put it another way: fish don’t have handles! But the oval loop on the upper-left corner of the engraved “half fish” image is worthy of particular note because a similar oval loop appears on the upper edges of the so-called “Jonah fish” image on the Jonah ossuary. That is, there appear to be a similar oval loop handles on the so-called “Jonah fish” image central to Jacobovici and Tabor’s theory, which have been omitted from much of the discussion concerning the image. And while several scholars have come forward now suggesting the image in question is in fact some sort or another of inscribed vessel, be it an amphora as suggested by Italian scholar Antonio Lombatti, a krater as recently suggested by Warden and President of Trinity College at the University of Melbourne, Dr. Andrew McGowan, or an unguentarium, as suggested by Kings College London Professor of Theology and Religious Studies, Dr. Joan E. Taylor, all agree the the image in question is not a fish. Possible handles present on the "Fish in the margins" photo (Available at: http://thejesusdiscovery.org/press-kit-photos/?wppa-album=3&wppa-occur=1&wppa-photo=16), as outlined by Tom Verenna, Mar. 10, 2012. 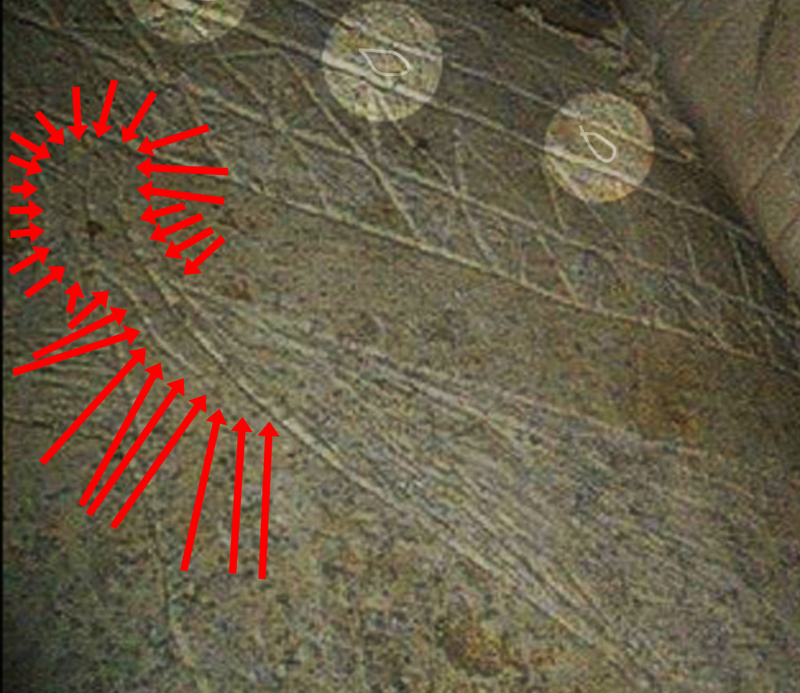 The red lines suggest possible handles on the top of an image that Jacobovici and Tabor interpret as a "fish's tail fin". Unfortunately, the red line used by Verenna to highlight the handles obscures the actual engraved lines. Additionally, the long vertical line descending from the top of the vessel appears to be the border surrounding the image. Therefore, I have attempted to highlight the handle using other techniques. In an effort to demonstrate that I am not adding or subtracting digital data to or from Jacobovici and Tabor’s images, I shall demonstrate the omission in a step-by-step process. Image from the thejesusdiscovery.org website captioned as "Fish in the margins". Note the spotlighted areas have had artificial digital "ink" added to the engraved lines to enhance their interpretation as fishes. (Available at: http://thejesusdiscovery.org/press-kit-photos/?wppa-album=3&wppa-photo=16&wppa-occur=1) Note also the oval loop on the left side of the so-called "tail fin". We have already discussed the three spotlighted images in the above image, which I have demonstrated were clearly digitally “inked” to appear like fish, when they clearly were not, as the engraved lines do not overlap. In the photo above, I have adjusted the “brightness” of the image by an increase of 52, and increased the “contrast” to a level of 92. As mentioned above, brightening and increasing contrast are common techniques designed to make engraved lines on objects more easily visible. Note that on the image below, I have spotlighted the oval looped structure on the upper-left corner of the large engraved image. 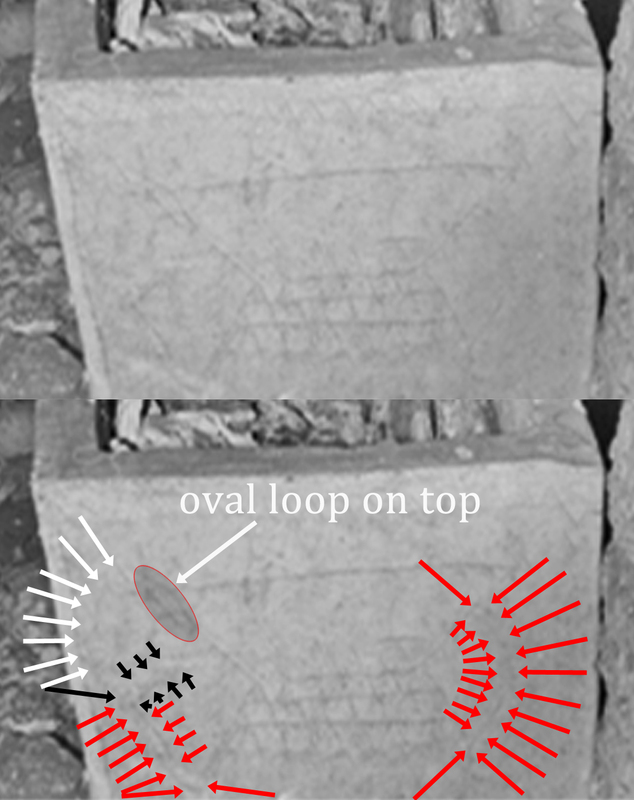 Note that the oval loop is in precisely the same location as the oval loop in the above photos of the “Jonah Ossuary” taken in 1981. The "Fish in the margins" Image 16 (Available at: http://thejesusdiscovery.org/press-kit-photos/?wppa-album=3&wppa-photo=16&wppa-occur=1) with the handle outlined by a series of red arrows. The handle at the top left of the vessel is clearly visible. In the side-by side comparison below, the shape of the handle becomes clear. 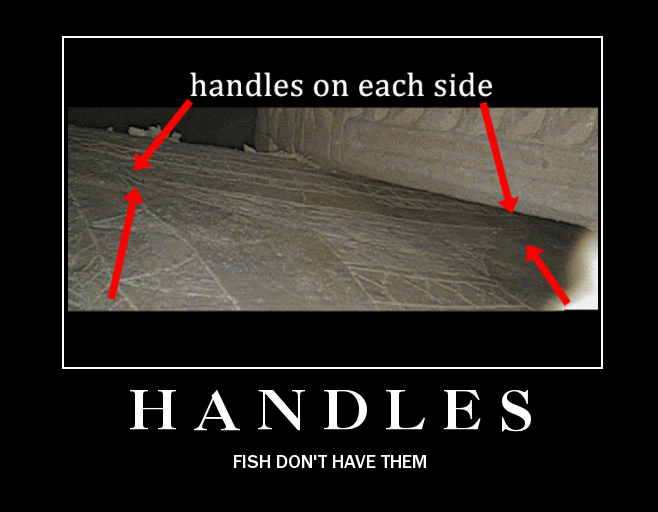 A side-by-side comparison of the handle in the "Fish in the margins" Image 16 (Available at: http://thejesusdiscovery.org/press-kit-photos/?wppa-album=3&wppa-photo=16&wppa-occur=1) with the handle outlined by a series of red arrows. The handle at the top left of the vessel is clearly visible. Thankfully, my friend and colleague, Dr. James Tabor, has graciously sent to me additional untouched, uncropped photos of the inscribed image Mr. Jacobovici and Dr. Tabor interpret as a “Jonah fish,” and has and given permission to reproduce these photos here in this article. In the images below, one can clearly see the oval loop handle at the top of the vessel. A closer look at the above image in over-under and side-be-side comparison allows us to highlight the handles. 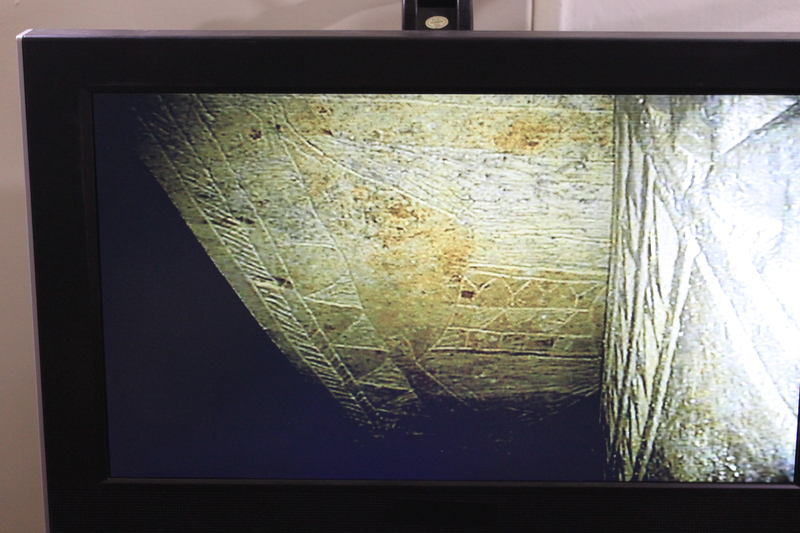 Additional photos from Dr. Tabor demonstrate the power of the robotic camera to peer behind Ossuary 5, which abuts the “Jonah Fish” Ossuary 6. These photos are perhaps the most telling of all as they reveal that there actually are handles on both sides of the top of the vessel. 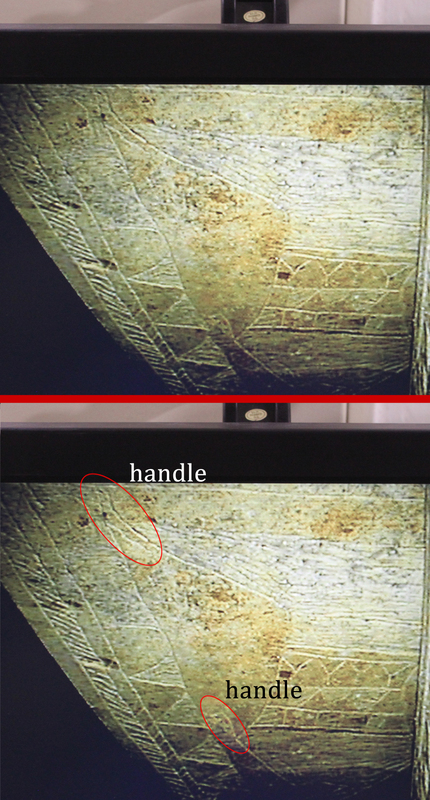 If we examine the portion of the image behind Ossuary 5, a view made possible by the robotic camera, we quickly note that there is a corresponding handle on the top right of the vessel as well. We also note that the top of the vessel is, in fact, straight, and not bent like the “CGI composite image” that has been circulated to the press. Again, a close up of the above photo demonstrates that the top corner of each side of the engraved image has a handle. 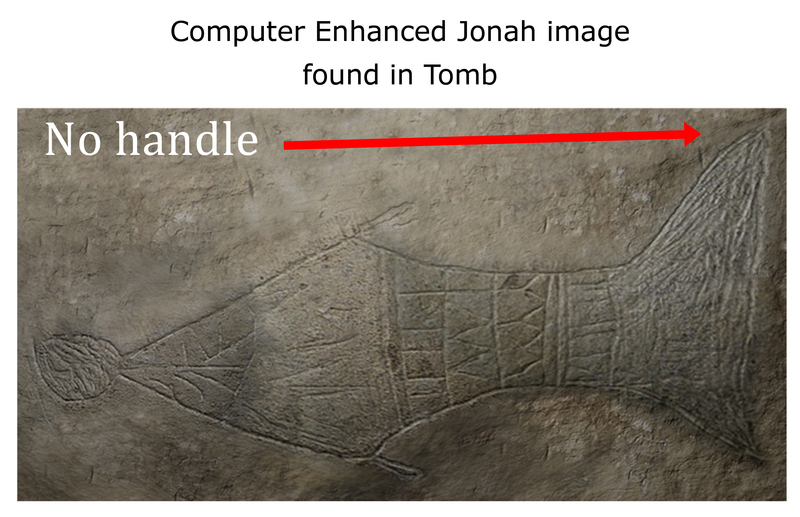 Image 13 from the thejesusdiscovery.org website, captioned "Computer Enhanced Jonah image found in Tomb" (Available at: http://thejesusdiscovery.org/press-kit-photos/?wppa-album=3&wppa-photo=13&wppa-occur=1). Note the handle visible in the "Fish in the margins" Image 16 is not reproduced in this image, and is cropped where the handle would be. Image 14 from the thejesusdiscovery.org website captioned: "Original Jonah Image - no cgi" (Available at: http://thejesusdiscovery.org/press-kit-photos/?wppa-album=3&wppa-photo=14&wppa-occur=1). Note that the image is cropped precisely where the handle should be. Clockwise from top left: The "Fish in the margins" Image 16 (available at: http://thejesusdiscovery.org/press-kit-photos/?wppa-album=3&wppa-photo=16&wppa-occur=1); the "Original Jonah Image - no cgi" Image 14 (available at: http://thejesusdiscovery.org/press-kit-photos/?wppa-album=3&wppa-photo=14&wppa-occur=1); "Jonah Image Photo 4" displays the intersection of Ossuary 6 (left) and 5 (available at: http://thejesusdiscovery.org/press-kit-photos/?wppa-album=3&wppa-photo=49&wppa-occur=1); the "Computer Enhanced Jonah image found in Tomb" Image 13 (available at: http://thejesusdiscovery.org/press-kit-photos/?wppa-album=3&wppa-photo=13&wppa-occur=1); Fig. 20 on p. 41 of original 'Bible and Interpretation' article entitled, "A Preliminary Report of an Exploration of a Sealed 1st Century Tomb in East Talpiot, Jerusalem," by Dr. James Tabor, published on Feb 28, 2012, rotated CW for vertical alignment. 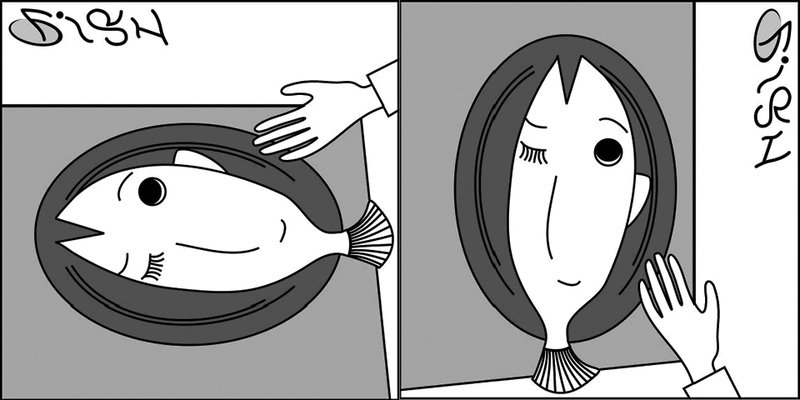 Note that only in the "Fish in the margins" image is the handle visible. It is cropped or otherwise not represented from each of the other images. But what is even more odd is the fact that the oval loop and the line proceeding from the loop down beneath the lip of the vessel are, in fact, represented by the digital artist who sketched the so-called “Jonah Ossuary,” as well as by the artists that created the museum quality replica of the ossuary for Mr. Jacobovici and Dr. Tabor’s New York City press conference. 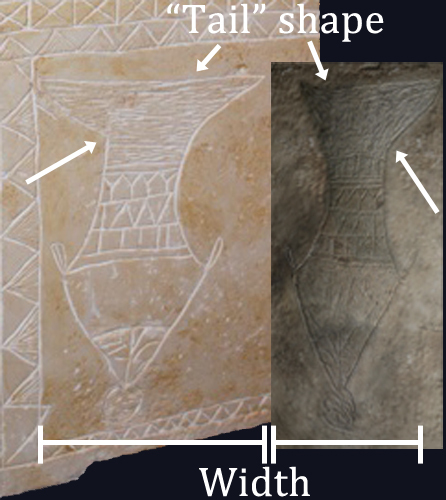 Note closely on the sketch of the “Jonah side” image, the artist appears to attempt to represent the engraved loop present on the ossuary. Likewise, if one looks closely, one will note that the artists who created the “museum quality replica” for Mr. Jacobovici and Dr. Tabor also appear to have attempted to represent the handle (or at least the inscribed line) just beneath the upper-left corner of the image inscribed on the ossuary. 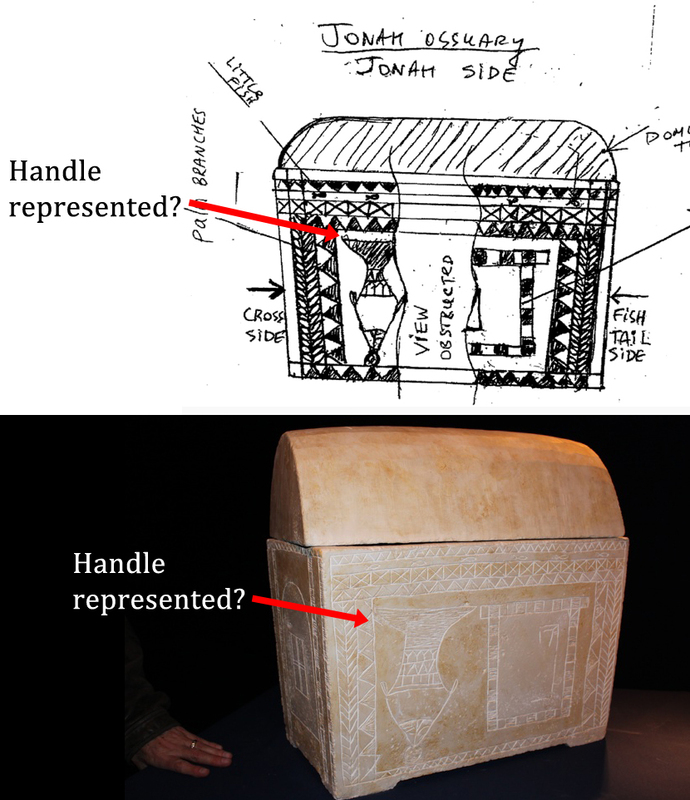 Sketch of "Jonah Ossuary" (top; Available at: http://thejesusdiscovery.org/wp-content/uploads/wppa/44.png) and "Museum Quality Replica" (Available at: http://thejesusdiscovery.org/wp-content/uploads/IMG_7422.jpg). A close look at each of these reproductions reveals that the artists actually attempted to represent the visual evidence of the oval loop in the upper-left corner of the inscribed image. The sketch represents the top loop, and the replica represents the etched line beneath the top left of the image. However, this feature was omitted from the "CGI composite representation" of the image. 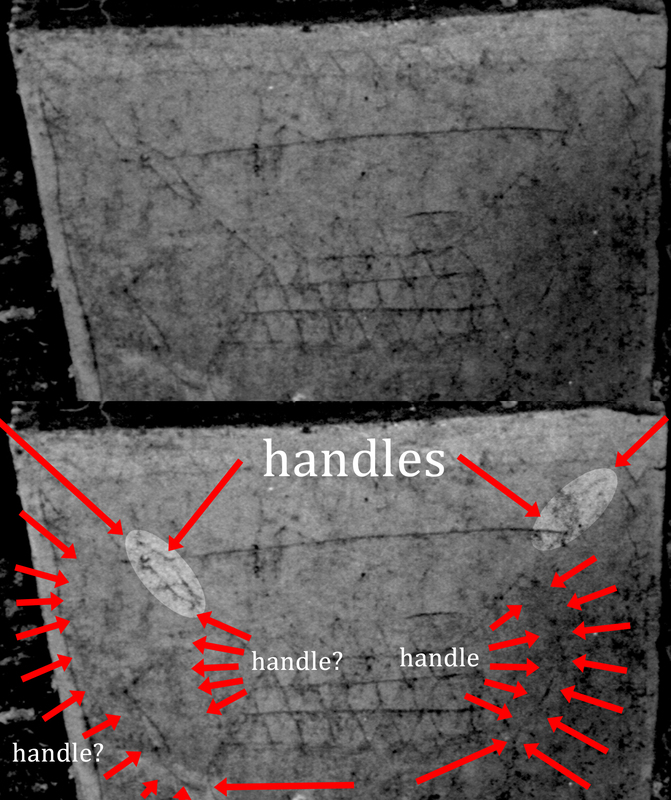 Thus, despite the fact that the engraved lines comprising the oval loop handle are as clearly visible at the same angle and in the same light as other engraved lines comprising so-called “fish’s tail,” and despite the fact that the same engraved oval loop and handles are also clearly visible on the so-called “half fish” on a different panel of the same ossuary, for some reason, Mr. Jacobovici and Dr. Tabor chose to omit this evidence from their representations, and chose not to represent the evidence in the heavily Photoshopped “CGI” “computer enhanced” “composite image” they have been offering to the press. 1) The “fish swimming in the margins” are the result of digital “inking” and are not fish after all, but simple unclosed, oval shapes used as decorations in the border. 2) The “half fish” on the side panel of the ossuary has clearly visible handles, and is therefore not a fish, but actually some kind of representation of a vessel. 3) The “Jonah fish,” which possesses oval loop handles similar to the “half fish” inscribed vessel (but which were not represented by the authors), is therefore not a fish, but actually an attempt at a representation of some other kind of vessel. Because, once again, fish don’t have handles. Thus the entire theory appears to be one big digitally manipulated fish tale (and not a fish’s tail). These are both legitimate questions. Let me reassure you I am not picking on anyone. Rather, as a scholar in the relatively young field of the Digital Humanities, it is important, nay essential to distinguish between the use of new technology for sensationalism and quick TV profits, and the appropriate use of that technology in humanities research. 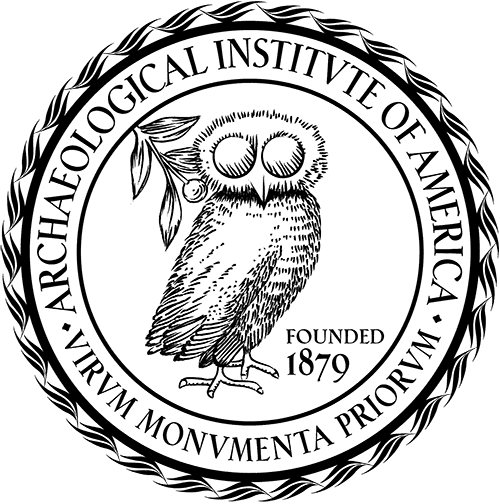 Mr. Jacobovici and Dr. Tabor’s entire project is based upon a new technological methodology and approach to archaeology. In that regard, they are doing the very thing that I did in my dissertation research – propose a new theory using a new technological methodology. And even if their theory were an absolutely solid, undisputed theory, complete with papers given at professional conferences and articles in refereed journal articles resulting in scholarly consensus, if the technology and digital imaging used to support that theory is not credible, or worse yet, shows obvious evidence of digital manipulation to favor the theory, it undermines not only their entire project, but the credibility of the Digital Humanities as a whole. As a Religious Studies scholar in the Digital Humanities, my job is to promote and defend the use of technology to solve research problems (in this case, an archaeological one). There are already enough senior scholars who are skeptical of the use of any new technology that does not reinforce the conclusions they reached without technology. One of my jobs is to convince scholars that the process of digital reconstruction is a transparent, trustworthy, academically accepted methodology. I don’t care if an argument pertains to Jesus, Jonah, or the Colosseum – my job is to promote and defend the use of technology in Humanities research. And when researchers do not follow standard practices of transparency, it hurts my own credibility as a Digital Humanities scholar as well. I’m trying to argue to the academy that the Digital Humanities are a good and beneficial thing, while others are peddling a sensational theory about fish on ossuaries and uploading multiple, unacknowledged, digitally “inked,” heavily Photoshopped images in support of their theory. 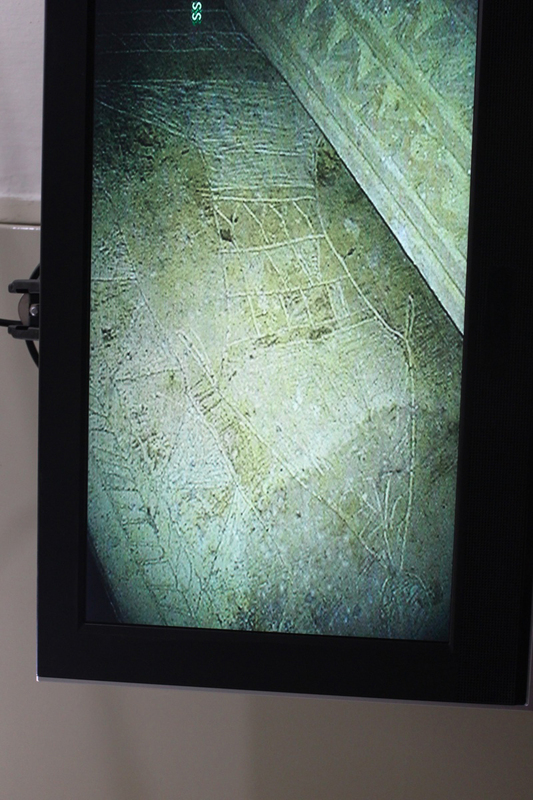 Ultra sharp images were required to make the inscriptions on the ossuaries legible to viewers, so engineers from the Inspection Technologies business of GE Measurement & Control custom designed a high definition camera for the crew. When this so-called “fish” gets debunked, and it will, how will GE feel about having its pilot use of a robotic camera scuttled by the academy, who refuted the claims of a documentary featuring its technology before it even aired? One can only hope that companies like GE will continue to support efforts in the Digital Humanities by credible scholars in the academy who will use the technology for real archaeology, and not for sensational television. And just think: when Mr. Jacobovici’s pseudo-documentary The Resurrection Tomb airs on Discovery this spring, we’ll get to do this all over again. Images are powerful. And because they are powerful, archaeologists must take great care in representing visual data properly in publication. For just as well-handled visual data can greatly inform the reader and provide new insights into archaeological research, so too can mishandled, or worse yet, deliberately manipulated visual images distort reality. Unfortunately, deliberately altered visual data have been used to support sensational claims throughout history like Bigfoot and the Loch Ness Monster, and this abuse has only worsened with the rise of digital photography and editing. It is now possible for unscrupulous individuals to manipulate photographs for the purposes of supporting sensational claims in the hopes that said claims can be published in print and on television to generate tremendous revenues for those making the claims. Unfortunately, digital technology is often times also used by some to distract from a weak argument. That is, some will elaborate upon and highlight the use of technology in the hope that the mere presence of sophisticated technology, which may have no bearing whatsoever on the interpretation of an object in under examination, will distract from any subsequent fallacious claims being made about said object. And, in more disquieting cases, digital technology is sometimes used to “enhance” or even fabricate evidence outright that supports an otherwise untenable claim. Or, to put it another way: if the evidence doesn’t fit, Photoshop it (especially if it looks fishy). Unfortunately, there is reason to believe that an image that has been circulating in the press as part of the marketing campaign in support of the new book by filmmaker Simcha Jacobovici and University of North Carolina, Charlotte Professor, Dr. James Tabor, entitled, The Jesus Discovery, and Mr. Jacobovici’s forthcoming documentary, has been digitally manipulated in such a way as to lead the reader toward a desired conclusion. That is, the image making the rounds in the press and published by Dr. Tabor on the Bible and Interpretation website has been digitally altered and made to look like an engraving of a “great fish” on an ossuary discovered in Jerusalem, in order to support the authors’ rather sensational claim. 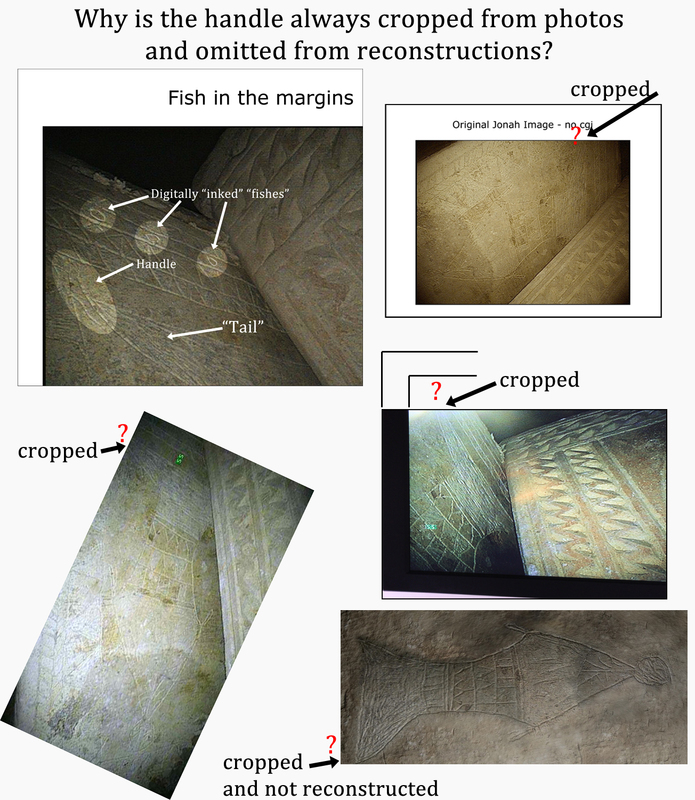 What’s more, in Dr. Tabor’s article, the manipulation of the photo of the “fish” on the ossuary has been made without any acknowledgment that the image has been manipulated. 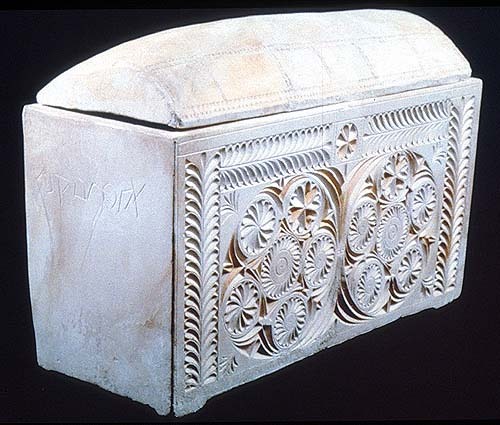 In his recent publication in Bible and Interpretation entitled, “A Preliminary Report of an Exploration of a Sealed 1st Century Tomb in East Talpiot, Jerusalem,” Dr. James Tabor describes “Ossuary 6” (the “Jonah Ossuary”) on page 20, and references two images: Figs. 20 and 21. Fig. 20 from page 41 of the 'Bible and Interpretation' article "A Preliminary Report of an Exploration of a Sealed 1st Century Tomb in East Talpiot, Jerusalem" by Dr. James Tabor, published Feb 28, 2012. The caption for this image reads: "20. Jonah image on front façade of ossuary 6." Fig. 21 from page 42 of the Bible and Interpretation article "A Preliminary Report of an Exploration of a Sealed 1st Century Tomb in East Talpiot, Jerusalem" by Dr. James Tabor, published Feb 28, 2012. The caption for this image reads: "21. Blowup of Jonah image." However, whether the image in question is a “blown up” or “composite” image, as soon as one looks at original photograph and the composite/blown up image side-by-side, one immediately notices that Fig. 21 is no simple enlargement of Fig. 20, but rather a highly-doctored digital artist’s representation of Fig. 20. Side-by-side comparison of Figs. 20 (right) and 21 from the 'Bible and Interpretation' article entitled, "A Preliminary Report of an Exploration of a Sealed 1st Century Tomb in East Talpiot, Jerusalem," by Dr. James Tabor, published on Feb. 28, 2012. I have rotated Fig. 21 (left) back to its actual orientation for comparison purposes. Let us examine the examples of digital image manipulation. 1. Fig. 21 in Dr. Tabor’s article has been enlarged, rotated, and cropped. Simple changes to scale that retain fundamental aspects of digital data, such as shape, color, and features are generally not considered compromises of the digital image. Example of archaeological photo indicating size and direction. However in cases where alterations of scale and orientation are made to images, it is common practice to supply a centimeter measuring stick or relative scale (see above) to convey relative size, and a compass pointing north (see above) to indicate the orientation (especially for rotated images). 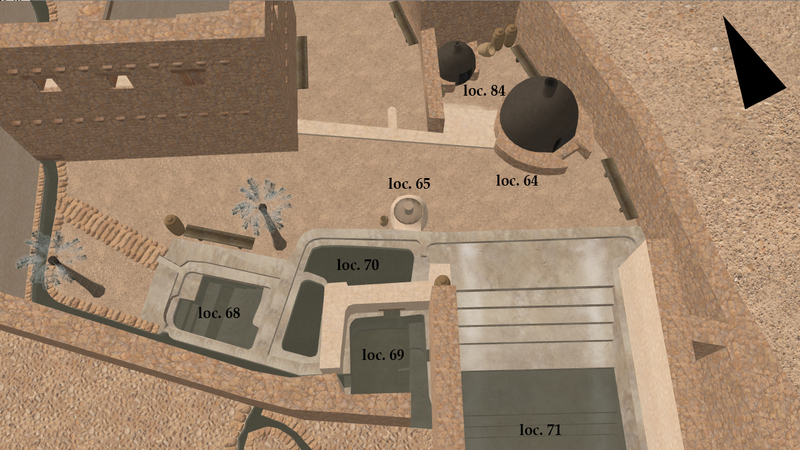 Digital reconstruction of the SE pottery annex at Qumran. 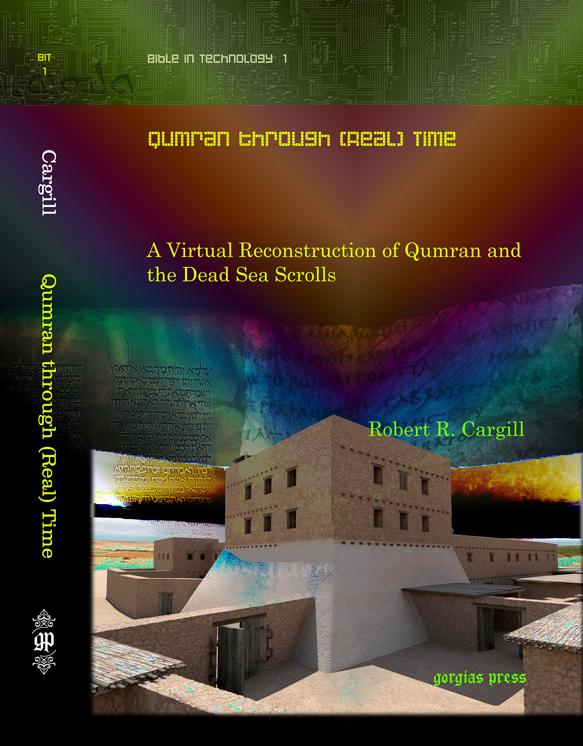 Photo from 'Qumran through (Real) Time' by Robert R. Cargill. Note the digital overlay indicating direction/orientation and loci. These size and direction indicators can even be added to hard to reach areas (like those accessible only through robotic arms) and digital reconstructions after the fact (see above). Both of these are absent in both of Tabor’s Figs. 20 and 21. 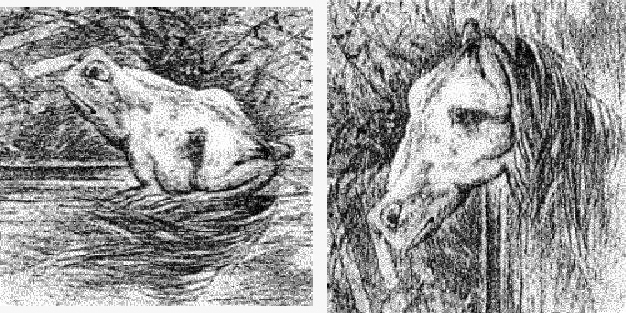 As the classic optical illusion of the frog and the horse or the fish and the girl (note that this fish actually has an eye) demonstrates, rotation and orientation make a huge difference when identifying an object. The psychological process of “cognitive priming” can be used to lead the brain to interpret certain objects in a desired manner. Michael Shermer’s book, The Believing Brain, examines this process in detail. It is quite telling that it was this digitally altered photo, Fig. 21, that was first sent to the press by Jacobovici and Tabor, and that the image was rotated to the side in most press reports. That is, the absence of any indication of proper orientation on the photograph allowed Jacobovici and Tabor to depict the image on its side, that is, in a manner more consistent with the natural orientation of a fish, rather than in its proper orientation with the tapered end down, which would more resemble some kind of ceramic or glass vessel. For instance, in the Yahoo News story by Eric Pfeiffer and the MSNBC Cosmic Log story by Alan Boyle on Feb. 28, 2012, the doctored image appears rotated onto its side with no indication in the caption or in the story that it has been digitally altered. Similarly, the Photoshopped image depicted in the Haaretz.com story by Nir Hasson on Feb. 28, 2012 describes the image as an “enhanced image” without noting that the image is out of context and rotated to better resemble a fish. Likewise, in the LiveScience story by Wynne Parry and the syndicated FoxNews.com story on Feb. 28, 2012, both the digitally altered photo and the photograph are included among the images. And while the doctored image under examination has a caption that reads, “A CGI-enhanced image” (italics mine), both the Photoshopped image and the photograph are rotated to resemble the natural orientation of fish, and no indication is given for either image that they have been rotated from their in situ orientation. Of course, Jacobovici and Tabor can “blame the press” for rotating the images, but they wouldn’t have had the problem had the orientation indicators and size and scale indicators been digitally placed on the images in the first place. Likewise, the fact that their own YouTube promotional videos also have the image turned on its side while they prime the brain with discussions about a fish (see the 1:35 mark) suggest that the image rotations were not the product of the press, but were done by Mr. Jacobovici and Dr. Tabor from the outset. It therefore appears that the repeated rotation of the image to its side and away from its proper orientation is not the result of trying to fit it on a page for publication, but may be a deliberate attempt to orient the image in such a way so that it better resembles the natural disposition of a fish. The image Jacobovici and Tabor released to the press appears to have been intentionally disoriented. 2. One then notices that Fig. 21 is a different color than Fig. 20. It appears more brown or sand colored, possessing much less green than Fig. 20. While this may be an attempt by the authors to make Fig. 21 look more like other known images engraved in limestone ossuaries, and while this is, in fact, an alteration of the digital data, we can excuse this acceptable manipulation of the image as a simple color correction from the original photo (Fig. 20). That said, many archaeologists do not like the practice of “color correcting,” as maintaining color data is the purpose of employing Munsell color charts in archaeological recording and photography. Such color information is lacking from the article and the figures. Thus far, the image has been enlarged, rotated, cropped, and color corrected. Unfortunately, Fig. 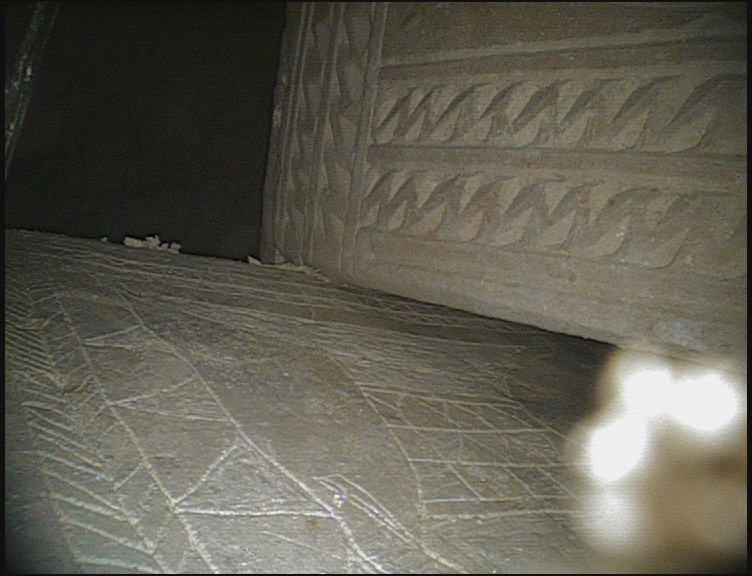 21 appears to have undergone an additional digital perspective manipulation to correct the oblique angle of the camera, which apparently was not perpendicular to the image when the photograph was taken. This is a more serious digital manipulation of the image, as it involves correcting the lengths and angles of objects to make them appear as if they were photographed at a perpendicular angle to the object (straight on). This technique is also used to correct so-called “barreling” and “fish-eye” lens effects that result from certain cameras and angles, especially during close-up shots. This more severe correction to the image in Fig. 21 can be excused as a digital correction of a poor initial camera angle, but it is customary to acknowledge that the image has been altered to correct for perspective. This is nowhere indicated in Dr. Tabor’s article. A side-by-side look at differences between Figs. 20 (left) and 21 (pgs. 41-42) from the original 'Bible and Interpretation' article entitled, "A Preliminary Report of an Exploration of a Sealed 1st Century Tomb in East Talpiot, Jerusalem," by Dr. James Tabor, published on Feb 28, 2012. I have rotated Fig. 21 (right) back to its actual orientation for comparison purposes. 4. Perhaps one the most egregious alterations to Fig. 21 appears in the so-called “tail.” The shape of the “tail” is altered to make it look more like the tail of a fish. The horizontal top of the “tail” in Fig. 20 is straight, but the corresponding line in Fig. 21 shows a tremendous bend on the right side. This is a deliberate result of the cloning process that produced the right side of the “tail fin” after Ossuary #5 covering part of the image in Fig. 20 was digitally removed from Fig. 21. The creation of this portion of the “tail” appears to have been deliberately drawn at an angle to further the illusion of a natural fish’s tail. Likewise, the left side of the “tail” in Fig. 21 also appears to have been gently rounded at the top, and then curved toward the bottom so that it better resembles a natural fish’s tail, while the corresponding area in Fig. 20 reveals a nearly L-shaped angle. "IMG_7422 Posted on February 29, 2012 by admin" located on thejesusdiscovery.org website is a photo of the "museum quality replica" of the "Jonah Ossuary" in question. It is worth noting that the reproduced image on the “museum quality replica” exhibited at Jacobovici and Tabor’s Feb. 28, 2012 press conference in New York does not match Tabor’s Fig. 21 image above, which was the image released to the press. The image is in its proper orientation, and not on its side. The artist(s) who engraved the replica more faithfully followed the original photograph in Fig. 20 above than did the doctored “composite” photo that was distributed to the press, as the replica more accurately reconstructs the top of the image. 5. The zig-zag triangle and braided border design visible in Fig. 20 to the left side of the image suddenly disappears from Fig. 21. The full size image of Fig. 20 (above) shows that the supposed “fish” is surrounded by a double border consisting of a line zig-zagging in between two parallel lines forming a column of triangles, that sits inside of a beautiful braided or herringbone design, all of which passes just outside the left “fin” of the “fish” in Fig. 20. However, this design element, which appears to be engraved equally as deep as the “fish” in Fig. 20, suddenly disappears in Fig. 21, despite the fact that many of the lines in the double border design appear at many of the same angles present in the “fish” design. Given the lighting, many of the lines comprising the border should appear along with corresponding lines making up the “fish” image, but are peculiarly absent. The border design appears to have been Photoshopped out of Fig. 21 using a combination of clone stamping, feathering, and use of the “healing brush” tool, as the resulting brown texture remaining after the deletion of the border appears indicatively blurry and feathered. Again, the motivation behind the deletion of the border may be understood as an attempt to remove the image further from its actual context. Combined with presenting the image on its side, eliminating the border gives the viewer the illusion that the “fish” is swimming freely in the ocean rather than bound and framed narrowly by an ornate border, which, along with its proper orientation, certainly detracts from its interpretation as a fish. 6. A segment of the “fish’s abdomen” near the supposed “tail” (that I have labeled Seg4 above) suddenly appears clearly in Fig. 21, but is barely recognizable if not completely absent in Fig. 20. Changes in lighting cannot account for this change, as the three segments (Seg1, Seg2, and Seg3 above) are visible in Fig. 20. Even if we allow for the presence of Seg4 in Fig. 20, it still does not match with the altered angle of the tail in Fig. 21. The addition or “enhancement” of the Seg4 layer may explain the more tapered, narrowed look of the “abdomen” of the “fish” in Fig. 21, perhaps leading the viewer away from interpretations of Fig. 20 as a nephesh monument or some other architectural structure, and encouraging an interpretation as a fish. 7. Finally, there are marks around the outside of Fig. 21 that betray the telltale signs of digital alteration, specifically, digital cloning. In a number of boxes above, I highlight examples of digitally produced marks that are identical in shape and size. (They do differ in color/tint, as this effect can be applied after the cloning process is complete.) Each mark of a mechanically engraved ossuary is unique in reality. At the pixel level of Fig. 21, however, the attempts at reproducing artificial “engraver’s marks” that I have isolated demonstrate, I believe convincingly, that someone used a Photoshop “clone stamp” tool to add artificial scratches all around the “fish,” and give the illusion of a naturally engraved image. 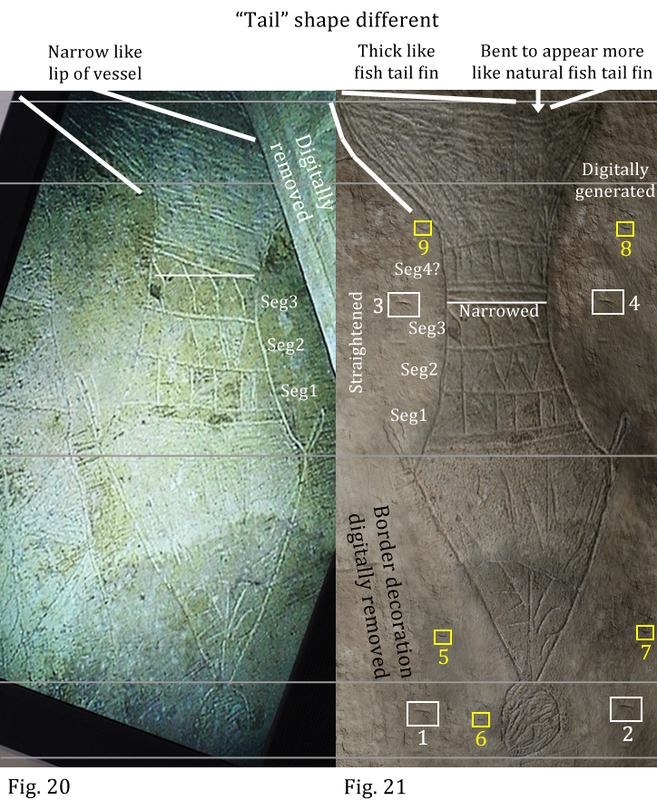 Comparison of digitally cloned "engraver's marks" added to Fig. 21 (pg. 42) from the original 'Bible and Interpretation' article entitled, "A Preliminary Report of an Exploration of a Sealed 1st Century Tomb in East Talpiot, Jerusalem," by Dr. James Tabor, published on Feb 28, 2012. Take for example the white boxes numbered 1-4 above. I have cut-and-pasted (a process similar to Photoshop cloning) these examples in the chart to the right. As you can see, the marks bear the telltale signs of being copied time and again around the outside of Fig. 21. Each cloned “engraver’s mark” is comprised of a main line attempting to represent an engraved gash. 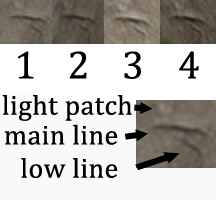 However, identical marks labeled as “low lines” appear just below each of the “main lines.” Likewise, a light spot appears above the left end of each of the “main lines.” Because such identical markings at the pixel level would never appear naturally on an ossuary, anyone familiar with Adobe Photoshop and digital imagery can attest that these are obviously the product of someone who has cloned gashes and attempts at “engraver’s marks” around the edge of the supposed “fish” in an attempt to make the altered image look more natural. Likewise, if we examine the yellow boxes above, I have highlighted additional examples of identical, digitally cloned marks that were added in an attempt to disguise the fact that cloning had been done to the image. By altering the shape of the “engraver’s marks” added to the digital image, it was hoped by the digital artist that the additional variety of artificially produced “engraver’s marks” would conceal the artificial marks, making the evidence of cloning less noticeable. Yellow boxes 5 and 6 above demonstrate a variation of the “engraver’s marks” digitally added to the image. Likewise, yellow boxes 7-9 show yet another deliberate variation. I have enlarged the identical marks in boxes 7, 8, and 9 in the chart to the right. 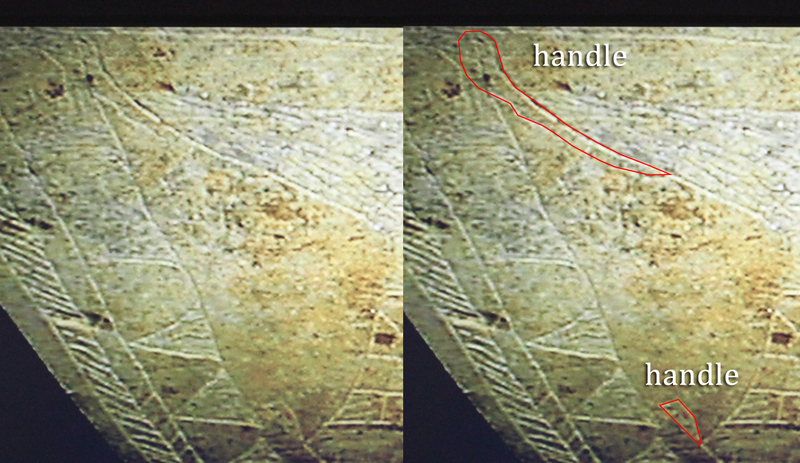 In each example, there is a central horizontal “main line” curving upward to the left, a small notch just below the center of the main line, and a curved, almost vertical mark just above each “main line.” Again, these examples reveal definite evidence of digital manipulation to Fig. 21 in Dr. Tabor’s article. The scholarly community has been nearly unanimous in their rejection of Jacobovici and Tabor’s claims. 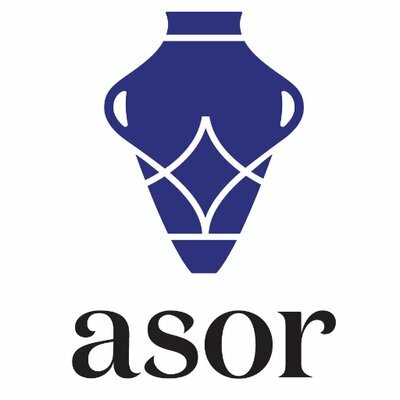 The American Schools of Oriental Research (ASOR) has posted on its blog a series of posts by reputable scholars critiquing the authors’ claims. And while these rebuttals vary in substance and style, from critiques of the inscription to critiques of the authors’ use of the Bible, one of the most intriguing rebuttals has been from a host of scholars critiquing the above altered image in question above, perhaps without the knowledge that it had been digitally altered. Specifically, perhaps based partially upon the demonstrable Photoshopped Fig. 21 above, several scholars (including Dr. Christopher Rollston, Dr. Eric Meyers, Dr. Jodi Magness, Dr. Stephen Fine, and myself) have argued that the image would be better interpreted as a nephesh monument. However, I cannot help but wonder how many of these expert opinions may have been based upon the digitally altered and deliberately disoriented image described above. It now appears possible that at least some of the scholars interpreting the image in question as a nephesh monument may have been basing some of their arguments on a digitally altered image, removed from context, and rotated away from its original orientation. The interpretation as a nephesh monument may still be a possibility. But alternatively, given a knowledge of the image’s proper orientation, it may also be interpreted as a representation of an amphora as suggested by Italian scholar Antonio Lombatti, or some other kind of vessel like a krater as recently suggested by Warden and President of Trinity College at the University of Melbourne, Dr. Andrew McGowan, or perhaps even an unguentarium, as suggested by Kings College London Professor of Theology and Religious Studies, Dr. Joan E. Taylor. The one theme shared by scholars interpreting the image both as a nephesh monument and as some kind of ceramic or glass vessel is this: they all agree it’s not a fish. But scholars can only evaluate the claims and evidence that authors publish, and proper context and the integrity of the image data are essential to one’s interpretation. The caption under Fig. 21 from page 42 of the original version of Dr. Tabor’s Bible and Interpretation article, “A Preliminary Report of an Exploration of a Sealed 1st Century Tomb in East Talpiot, Jerusalem,” published on Feb 28, 2012 simply read: “21. Blowup of Jonah image.” Except, it obviously was not. As I have shared the above evidence of image manipulation with my scholarly colleagues, including an exchange with Dr. Tabor on the ASOR Blog, it now appears that Dr. Tabor and Mr. Jacobovici are attempting to take steps to correct their descriptions about the misleading photo in question (Fig. 21 above), which has, in fact, been removed from its context, rotated away from its in situ orientation, and digitally altered, by updating the captions describing these images, and in some cases, correcting their orientation after the fact. Page 42 of the article by James Tabor entitled, "A Preliminary Report of an Exploration of a Sealed 1st Century Tomb in East Talpiot, Jerusalem," published at 'Bible and Interpretation.' The original article (left) was published on Feb. 28, 2012. The revised article (right) appeared on the site on March 2, 2012. Note that the orientation of the image in Fig. 21 (left) is rotated away (counter-clockwise) from its in situ orientation, more closely resembling the natural disposition of a fish. However, the same image in the updated version of the article on the right has been rectified to its proper orientation (although it has now been flipped horizontally, with the digitally reproduced section of the "tail" on the left side). 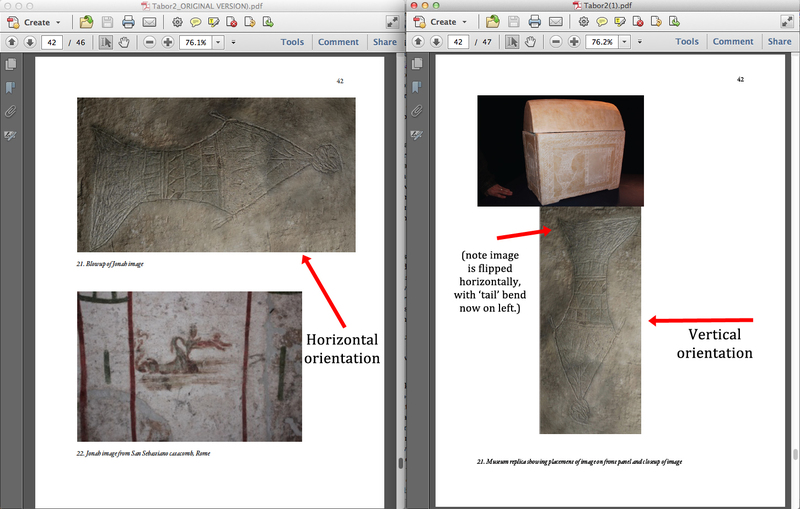 Note also the the revised caption on the revised article (right) still reads, "Museum replica showing placement of image on front panel and closeup of image," despite the fact that the image in question is still not a "closeup" of the replica, and still does not indicate that the photo has been heavily Photoshopped. For instance, the editors at Bible and Interpretation confirmed to me that they have, in fact, taken down Dr. Tabor’s original article (which I have reposted here for purposes of comparison), and replaced it with a new, revised version. They also updated the title of the revised version with an editorial comment noting that Dr. Tabor’s present article is a different version from the one originally published. Editor's comment (see red arrows pointing to text in parentheses) noting that a new version of James Tabor's 'Bible and Interpretation' article, originally published Feb 28, 2012, has been revised. By the way, if you are one of the 18,000 that have downloaded that article in the last two days take a look again at the picture in the appendix–we have added the museum reproductions of the ossuaries. 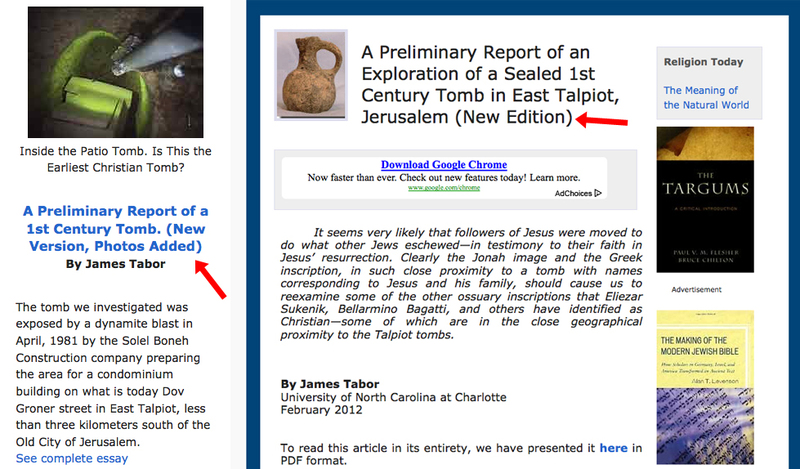 A side-by-side comparison of the "museum quality replica" (left, source: http://thejesusdiscovery.org/intro/img_7422/) and the digitally altered photo from Dr. Tabor's 'Bible and Interpretation' article. Both are artist's renditions of the image on the ossuary. Note the difference in shape and scale even in these artists' renditions. Note also that the digital reproduction from the revised 'Bible and Interpretation' article has now been flipped horizontally. The problem is, if one examines the two images in Fig. 21 of the new article closely, the images still don’t match! The bottom image is not a “close up” of the top image at all. Rather, the top image is an artist’s reconstruction on a replica, and the bottom image is a highly Photoshopped image. Look closely at the so-called “tails”: the bottom image has a bent “tail” on the top left (as the digital reproduction from the revised Bible and Interpretation article has now been flipped horizontally), while the image on the “tail” on the replica is flat and straight. Finally, the caption under the same image on the thejesusdiscovery.org website finally concedes it is a “computer enhanced” photo. Unfortunately, these photos were not made available on the website until after the book had been released, after the press conferences, after scholars had begun their initial critiques, and after I had begun to point out that the image in question (Tabor’s Fig. 21) had been digitally altered as described above. The question is: which pictures should we believe? Should we accept the artist’s rendition on the “museum quality replica,” or the doctored, heavily Photoshopped, “computer enhanced” digital “composite representation”? And this is the point: the image that was released to the public was a Photoshopped image. It was rotated. It had been altered in other ways, including having the “tail” reshaped to more closely resemble that of a fish. Yet, these were the images given to scholars to evaluate. And that’s what we evaluated. 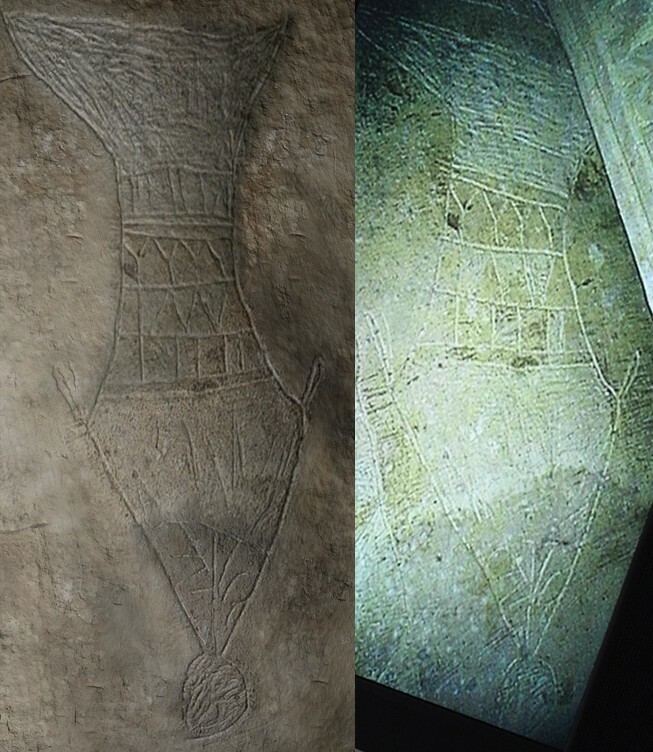 I cannot speak for other scholars, so I shall only speak for myself: I admit that my original suggestion of some similarity between the image in question and Absalom’s Tomb stemmed from my analysis of the photo sent to the press (Fig. 21 above), which I have now demonstrated to be a doctored photo that was rotated to more resemble the natural disposition of a fish, and which lacked any indication of size, scale, or orientation like a cm stick or compass point. Once I realized that I had based my analysis upon a doctored photo, I publicly conceded that I no longer favor the interpretation as a nephesh memorial, but instead favor an interpretation of an amphora, krater, unguentarium, or some other form of vessel. I also noted that as scholars, we must be willing to alter our conclusions based upon new (or in this case, accurate, in context) evidence following a consensus of our trained peers. The question is: are Mr. Jacobovici and Dr. Tabor willing to do the same? Now that they’ve had the opportunity to experience the peer-review of trained professionals, will they heed the nearly unanimous voice of the archaeologists and scholars stating that the image under investigation is not a fish? Unfortunately, the visual evidence detailed above compels us to conclude that Fig. 21 from pg. 42 of Dr. James Tabor’s original Feb 28, 2012 Bible and Interpretation article entitled, “A Preliminary Report of an Exploration of a Sealed 1st Century Tomb in East Talpiot, Jerusalem,” has experienced a high degree of digital manipulation. Given the changes to the “tail fin” of the supposed “fish,” and given the deliberate rotation of the image’s orientation causing it to more resemble the natural orientation of a fish without offering a compass point or any indication on the image whatsoever that the image has been rotated, it can be argued that the motivation behind making these digital alterations to the image was the desire to create, or at least “enhance” the illusion of a “great fish” swimming freely in the ocean, while vomiting forth a human head. We should not state that the image has been “faked,” as there is obviously an image on the ossuary. However, we are forced to conclude that the image was digitally manipulated and its orientation altered in such a way so as to encourage and enhance its interpretation as a fish over other possible interpretations. The fact that Dr. Tabor is still using the doctored photo as “evidence” upon which to base his recent rebuttals of other scholars’ critiques of his theory on his own jamestabor.com blog and in a new Bible and Interpretation article is quite telling. What is more troubling is the prospect that other images published by Mr. Jacobovici and Dr. Tabor may be similarly digitally “enhanced” without proper acknowledgment. 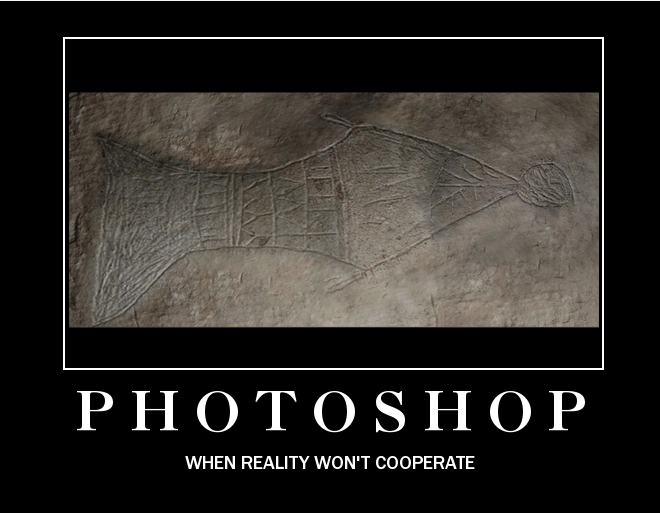 If such image manipulation is demonstrated in the “Jonah fish” image, which is central to their sensational and already highly spurious claim, how can we be sure that other images, such as those of the inscriptions, have not experienced similar amounts of digital alteration? Let us remember that the image distributed to the press and on the “museum quality replica” are, in fact, artist’s renditions of the image on the ossuary and not the image itself – a rendition that the authors desperately want viewers to interpret as a fish. With the credibility of the visual evidence demonstrated above now highly suspect, and with the scholarly consensus nearly unanimously interpreting the image as something other than a fish, we should be all the more skeptical of any and all claims made by Mr. Jacobovici and Dr. Tabor regarding any claim of Jonah, a fish, or so-called “new evidence” of early Christianity obtained from these tombs. Because if it doesn’t look like a fish, and doesn’t swim like a fish, it may very well be an ancient vessel cleverly Photoshopped to look like a fish.